Grilling corn on the cob is a popular way to prepare the summertime food because it can be done in just a few minutes' time. But how you choose to place the corn on the grill is a matter of personal preference. Some people prefer to try different methods and see how the flavors of the corn change as they are exposed to heat and smoke directly as opposed to being cooked with a protective layer in between. That is the role husks sometimes play, but if you don't have corn husks there are still options available to you. Place a layer of aluminum foil between the corn cob and the grill, if desired, to minimize charring of the corn. Conversely, you can place the corn cob directly onto the grill's grates, if preferred. 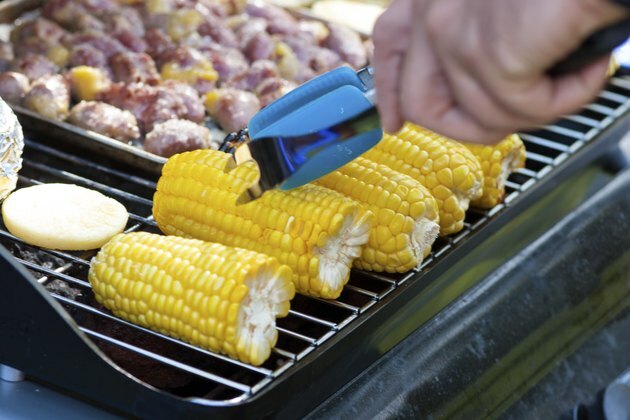 Brush a small amount of melted butter or olive oil onto the corn to lock in moisture and slow charring. Rotate the corn every couple of minutes, brushing oil or butter on as needed to add flavor and protection to the kernels. Pull the corn off the grill after about 10 minutes. Serve immediately.